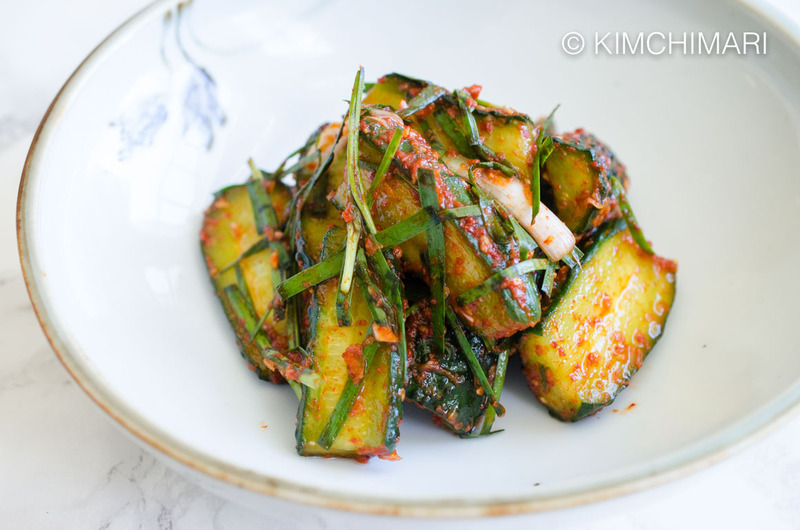 Cucumber Kimchi (오이김치 Oi Kimchi) is the most delicious and refreshing summer Kimchi of all Kimchis. 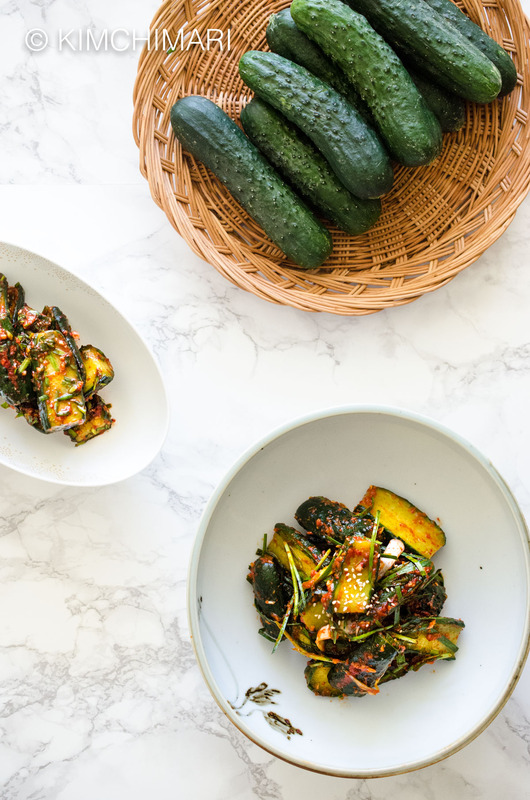 The crunchy texture and the refreshing taste of cucumbers are perfectly preserved in this fabulous Korean Cucumber Kimchi that is Vegan and Gluten Free. 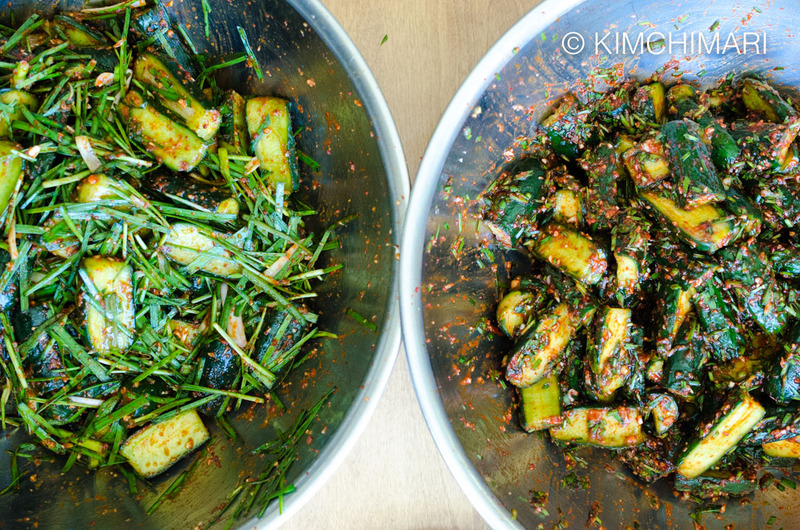 Cucumber Kimchi is also one of those Kimchi’s that are rarely served at restaurants or sold at markets. Why? I am not totally sure but my guess is that Cucumber Kimchi doesn’t last as long as regular cabbage kimchi, it usually becomes mushy after few weeks and you really can’t eat it at that time. Also, once it sours, you can’t really repurpose it in jjigae or jeon like you can with cabbage kimchi. I have been meaning to post a recipe but because again, my husband and my daughter are not big fans (but my daughter actually liked this recipe), it just naturally got pushed down the priority list. I think cucumber is one of those vegetables that you either love it or hate it. But if you love cucumbers and kimchi, you will LOVE this. And it’s really the simplest kimchi recipe to make with NO fermented sauces or flour pastes. You just have to make sure you buy the right kind of cucumbers and that they are properly pickled with the right kind of salt. Don’t use common Garden Cucumbers that are waxed which is sold at regular grocery stores. And no, making kimchi with peeled cucumbers is not recommended. Korean cucumbers work best of course, but if you can’t find them, try Persian, Japanese or English cucumbers that do not have big seeds in them. Also make sure they don’t have any bitter taste. A BIG THANK YOU to my friend Mrs. Woo! She makes a lot of delicious kimchi at her home and I asked her if she could help me by making them with me. Not only did she make these with me, she even went shopping for me!! I am so grateful for her friendship. 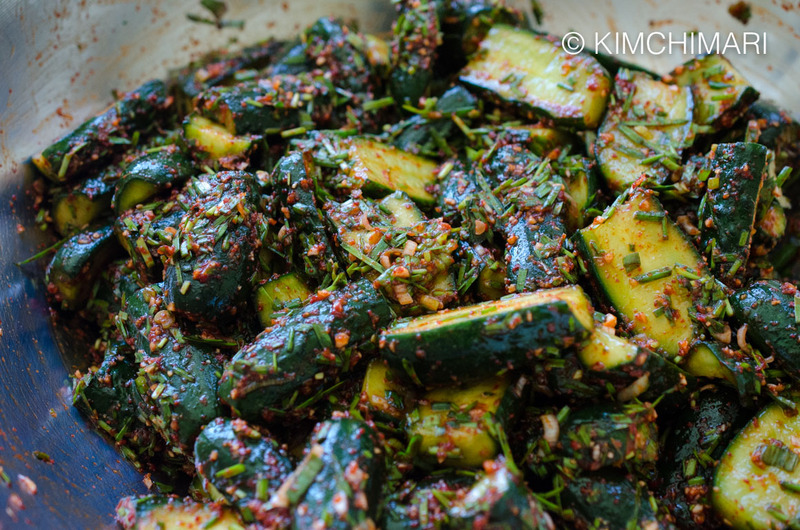 This recipe was based on how she makes her cucumber kimchi by feel. We made 20 lbs in total, 3 different batches and I really like this version because it is extra refreshing since this recipe does NOT use Fish Sauce. I hope this recipe will find their way to her children someday so that they can make it at home when they grow up. 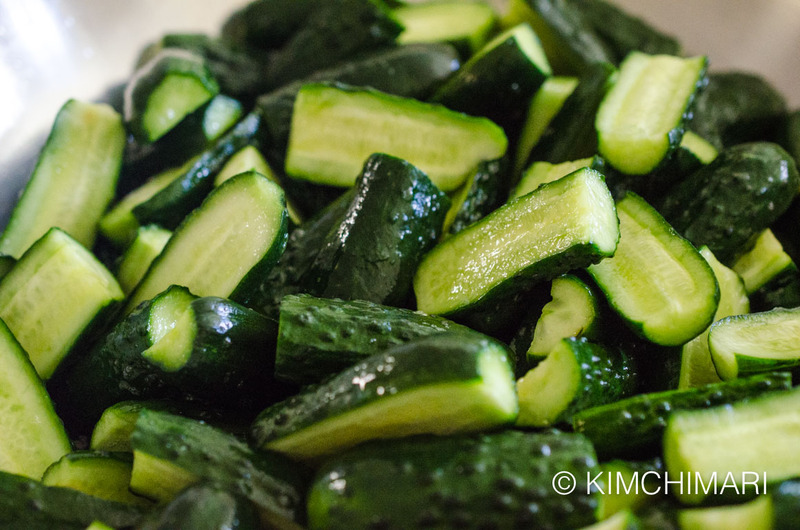 Now, let’s get started on pickling some cucumbers for our Cucumber Kimchi! 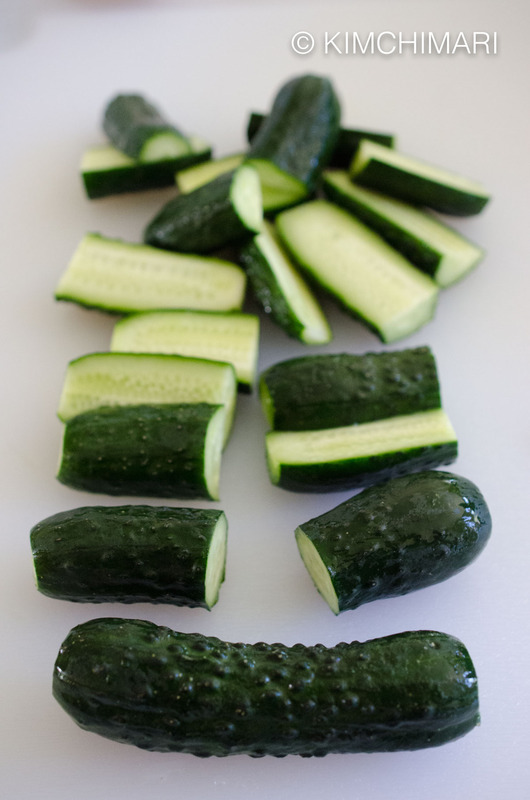 Cut cucumber ends, and then into halves and then further cut each half horizontally to make pieces. 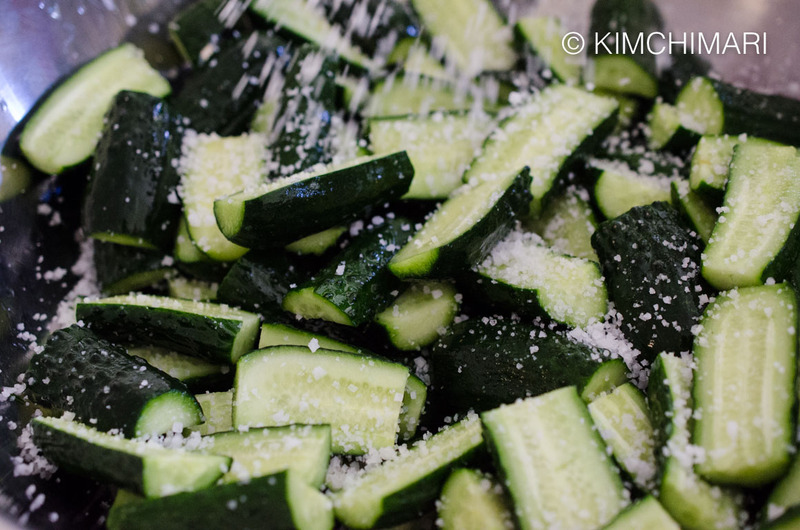 In a large bowl, add the cut cucumbers and sprinkle 1/4 cup cheonilyeom salt. Toss cucumbers with your hands so that they are evenly coated with salt. Pickle for 3 hrs or until cucumbers have shriveled up. See the difference between fresh cucumbers (on the left) vs cucumbers salted after 3 hrs (on the right). 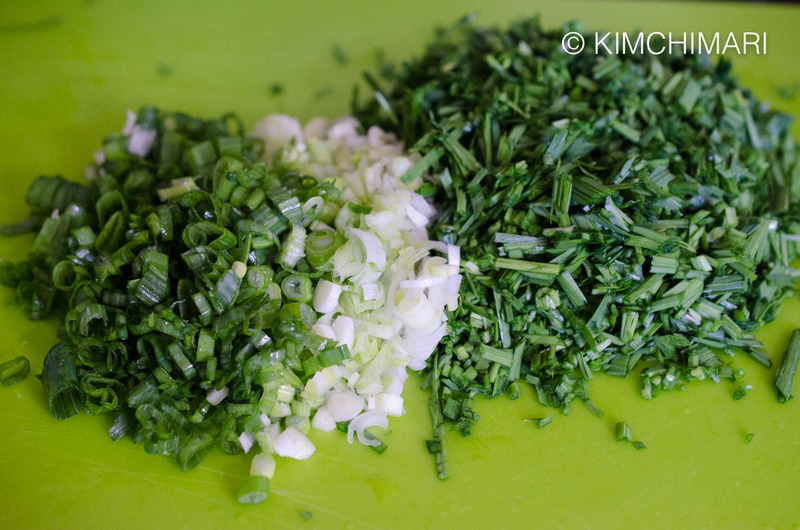 While cucumbers are pickling, prepare seasoning by cleaning and chopping chives, green onions and garlic. When cucumbers are pickled, drain cucumbers in a colander. DO NOT RINSE but just let excess liquid drain for few minutes. In a large bowl, add the cucumber, red chili powder, sugar, garlic and salt. Put plastic gloves on and mix everything gently. Transfer cucumbers to a container and leave at room temp for 24 to 36 hrs and then put in fridge. How long you ripen your kimchi at room temp depends on how quickly you want to eat it and keep it. If you want to eat it asap then leave it out 36 hrs or more until it tastes ripe. If you want to store it longer then, put it in the fridge after 24 hrs and let it ripen slowly in the fridge. Cut cucumber ends, and then into halves and then further cut each half horizontally to make 4 flat pieces. In a large bowl, add the cucumber, red chili powder, sugar, garlic and salt. Mix everything gently. 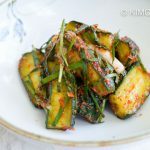 Thin skinned, crunchy cucumbers with little or no seeds like Korean, Kirby pickling, Persian cucumbers that are NOT waxed work best for this recipe. Thick skinned, waxed cucumbers are NOT good for Kimchi making. What is the best type of cucumber for Kimchi? 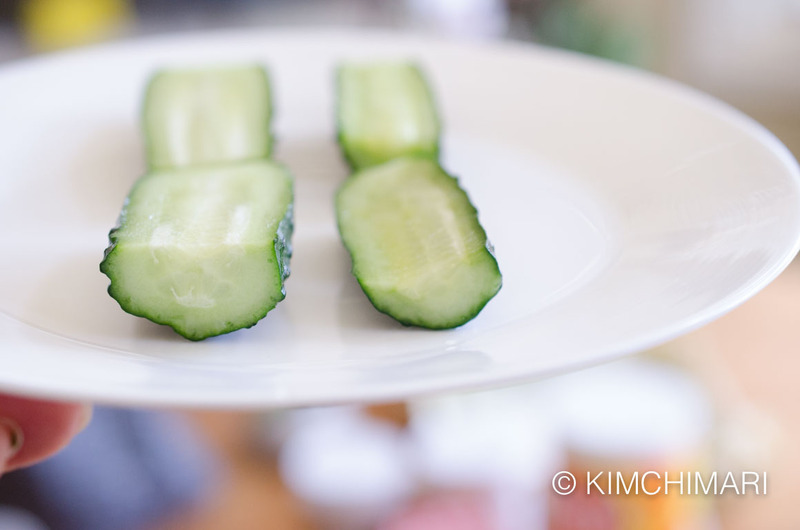 Thin skinned, crunchy cucumbers with little or no seeds like Korean, Kirby pickling, Persian cucumbers work best. Thick skinned, waxed cucumbers are NOT good for Kimchi making. Here’s a post that explains all the different types of cucumbers. How is this different from Stuffed Cucumber Kimchi (Oi Sobaegi 오이 소박이)? In terms of taste, it is probably not hugely different but this is lighter and fresher tasting. It is basically a simplified version of the traditional Oi Sobaegi where the cucumber is only cut partially in the center and then stuffing is added in. Serve this cold right from the fridge and you will LOVE it!! 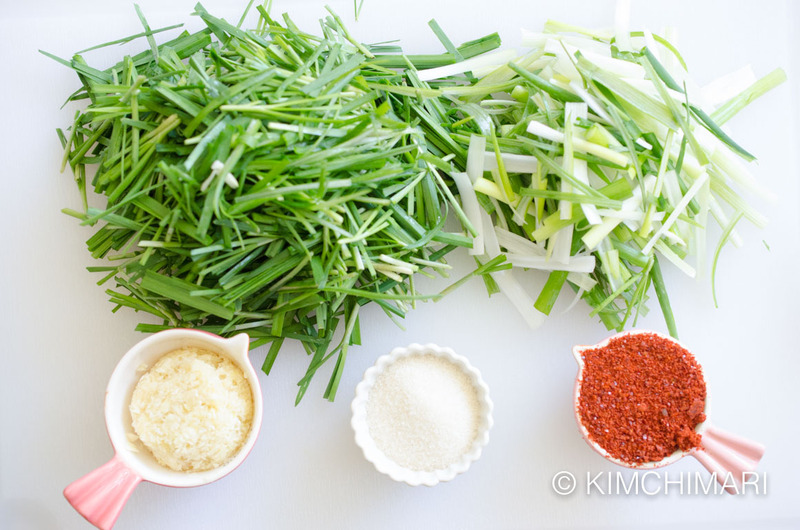 It would also be a very good FIRST KIMCHI to try if you are still new to eating Kimchi. Check my No Crazy Kimchi chart for more details on how to ripen Kimchi properly. what is Korean Cheonilyeom and where can I get it (h mart ? ), also I went to the link about the cucumber types and they did not mention Korean cucumber……are they like the japanese one that were mentioned ? It’s Korean Solar Sea Salt and yes, you can buy it at hmart. You can read more about Korean salt here – https://kimchimari.com/on-k-ingredients/. Oh, sorry I was not totally clear on the Korean cucumber, they are similar to Japanese but not quite. I couldn’t find the scientific name but you can only buy them in Korean markets for now. As I said in the post, if you use any kind of pickling cucumbers, not waxed, with thin skin and sweet crunchy inside, it will work beautifully. Thanks so much for asking! you mentioned green onions in your instructions and photo but I don’t see it in your ingredient list. How many green onions?